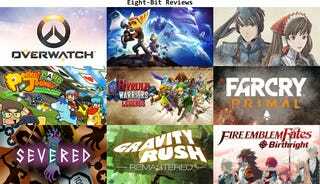 Welcome to the first installment of Eight-Bit Reviews! Eight-Bit Reviews are byte-sized reviews that consist of just 256 characters. Each review comes with a rating from 0 to 3 (0 being worst, 3 being best). All games were purchased by yours truly and played for as long as required to experience enough of the content to generate an opinion. Overwatch is a masterfully designed game with fun and varied and attractive characters, multiple different game modes, gorgeous and well-designed zones, brilliant and rewarding post-game stats displays, built-in highlights, non-offensive microtransactions solely for cosmetic items, and so on. The PS4 version of Ratchet and Clank is an update to the original on PS2 that goes well beyond a typical remaster. New fun weapons are abundant and upgrading them is the name of the game. The “omega” weapons bring more possibilities. At just $40 retail, as action platformers go, this game is a fantastic value. Valkyria Chronicles on PS3 was a treasure, and the remaster is very much a port of the original with some upgraded visuals during gameplay. The game feels old. There is no auto-saving, and cutscenes are not upgraded at all. The original was such a great turn-based strategy JRPG that all is forgiven, though. PCJ is certainly a horse racing solitaire role playing game. At $6.99, it practically falls into mobile game territory. Yet somehow, it feels like it has depth. The card game is simple but enjoyable. The horse racing has frustrating elements, but makes sense. Raising and breeding horses is simple but fun. This is a decent port from Wii U considering the massive hardware differences between platforms. Controls updated for 3DS make sense, and it runs well on the New 3DS but terribly on the old 3DS. And honestly, it is more of the same. If you like musou and Zelda then you will probably enjoy it, but only on a New 3DS. Far Cry Primal is the best first-person cave man/beastmaster simulator I’ve ever played. The game is all about its brutal action, surprisingly deep stealth, and usage of AI-controlled beasts. The narrative is weak and the beast AI is problematic at times, but it plays well, looks great, and is worth a try. Severed is an exclusive in the twilight days of the PS Vita. Its strangely beautiful yet slightly grotesque aesthetic is intriguing and the Etrian Odyssey-style first person view and map are refreshing, but the gameplay consisting of Fruit Ninja-esque swiping gets tiresome. If you own a Vita, try it out. Surprisingly, Gravity Rush translates very well to the PS4. Many thought its control scheme would not work well, but it maps to the PS4 controller well. The game is a pleasure, the story is witty, and the remaster looks absolutely gorgeous. With a sequel coming, this remaster is well worth playing through. I enjoyed the previous Fire Emblem game a great deal, even going as far as completing it. I can’t yet say the same for Fates. Fates is honestly more of the same from Awakening. New classes are good and different between factions, but the story is mediocre. I ended up putting it down halfway through Birthright. Overwatch is a goddamn treasure. I say this as someone who is not typically interested in multiplayer shooters, but who used to enjoy team shooters. It kind of makes sense that I like Overwatch because it feels like the ultimate class-based team shooter. Let me list the things I love about Overwatch: It has fun and varied and attractive characters, multiple different game modes, gorgeous and well-designed zones, brilliant and rewarding post-game stats displays, built-in highlights, non-offensive microtransactions solely for cosmetic items, and so on. Enemy characters have louder footsteps, and their footsteps are distinctive—the samurai Hanzo is light on his fight while D.Va in her walking mech sounds like she’s clomping around in a robotic exoskeleton. Character silhouettes are so distinct that you can identify which character is around the corner based on the shadow it is throwing on a wall down the hall. The post-game screens are brilliant and feel rewarding regardless of your personal skill level. It is much more than just a leaderboard, recognizing you for performing well with stats that make sense for the particular character(s) you used that game. A few technical problems on console do arise, and there are some imbalanced characters on particular maps and modes, but I have faith that Blizzard will fix these issues over time because they have legendary support of their games. No matter what kind of gamer you are, you owe it to yourself to play Overwatch. It’s that great. Thanks for reading! You’ve been reading content by M.J. (alias Eight-Bit Hero), a scientist, father, and gamer living in the San Francisco Bay Area and Hiroshima. Talk at me on Twitter at @EightBitGen, email me here, or play with me on PSN or Steam as Patchingko. If you would like to contribute to Talk Amongst Yourselves, click here.